Be it the original flavour of Bengal’s sought-after fish cutlet or the popular north Indian shammi kebab, at Monkey Bar — the Indian version of a gastro pub — you will be reminded of your roots while letting your hair down. The pub has its outlets in three metros — Delhi, Mumbai and Kolkata — and mini-metro Bengaluru, and each dish has its own flavour of the soil perfectly tucked in to the international palate. Take the tikki of joy for example. Kolkata’s very own fish cutlet is lightly poached as opposed to boiling it, and coated with Japanese Panko-style breadcrumbs before it is fried. Then, the mouth-watering shammi kebabs, which have been rechristened shammi sliders, with the big meat chunks wrapped in a slider-style bun. Down west, there is Mumbai’s very own vada Pav which is cooked in fresh laadi pav with a dab of butter and ghaati masala from Bombay with salted chilli. There is also the Goan chorizo pao — chunks of smoky Goan sausage sauteed with sliced onions, garlic and tomatoes and stuffed inside a toasted and buttered pav. While choosing your poison, try mangaa, one of the most ordered cocktails here, that is made with aam panna, sweet lime, jeera, salt and vodka. “The idea is to juxtapose good food in the pub space. We have not aped the Western idea of a gatro pub blindly. 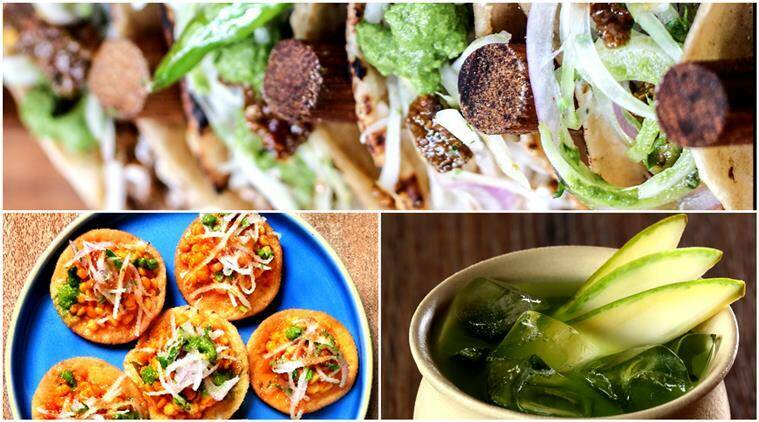 We have tried to make it unabashedly Indian,” chef and partner Manu Chandra said. Gastro pub, the term coined in 1991, denotes a restaurant moulded in pub culture that became popular in the United Kingdom. However, the concept has drawn occasional flak for watering down the essence of a pub. “We do specialise in food and in that way it is a departure from the stereotype concept of a gastro pub, but we do not allow children below the age of 18 in the evening across our four centres. They can come for lunch, but in the evening we have more people who consume liquor and the bar is more active,” Chandra said. At the Kolkata outlet, you see the cult protagonists “Gupi” and “Bagha” of Satyajit Ray’s classic “Gupi Gayen Bagha Bayen” painted on the wall that hits you on entering. The bar has a miniature version of a British theatre-style canopy which illuminates this space. Also striking is a sculpturesque light installation strung from the high roof truss. Drawing design inspiration from the colonial clubs of Kolkata, the tall arched windows allow you a panoramic view of the surroundings. The joint, perched on the ninth floor of Knox building in Camac Street, a bustling South Central Kolkata avenue, also has breakfast spread with burgers ruling the roost. Try the new breakfast burger — a hearty combo of grilled chicken, avocado, fried egg, cheddar and onion jam for those midday cravings. New small plates include dishes inspired by international favourites like the kung fu rolls, devilled fish baked brie, prawns pil pil and sticky Korean chicken. There’s a new pizza platter as well which includes exciting toppings such as mushroom and truffle oil pizza, Iti aunty’s daab chingri pizza — a marriage of local cuisine and an Italian favourite — and pepperoni picante pizza. Coming to the main course, the likes of a Soulful Bowl include a platter of gobindo bhog rice and pickled vegetables alongside egg, cucumber, scallions and fried onions, with a choice of chilly paneer, chicken katsu, beef bulgogi or barbeque pork. Also on the menu is thai curry and Kerala beef fry with the saag kebab — an interesting accompaniment to your favourite drink. Chandraji’s mutton curry (a succulent mutton dish served with gobindo bhog rice), mustard grilled fish (seasonal fillet with garlic mashed potato, grilled vegetables and spiked mustard sauce, and hearty meals for meat lovers like the MoBar bork and chicken 65 are also on the menu for a filling lunch or dinner. The desserts carry forward the same quirky tone, enticing you with a mishmash of flavours that melt in your mouth. A sundae is converted into a multi-layered sandwich with great skill in the Mobar sundae sandwich. The signature, chocolate pot de creme with salted caramel topped with caramel popcorn and the gondhoraj lime tart with lebu, curd and torched meringue are sure to bring a perfect end to your meal. There is a hookah space as well where customers can go for a smoke. On weekdays, there is live music with space kept for you to shake a leg as well.